We expose it, cover it, paint it, tattoo it, scar it, and pierce it. Our intimate connection with the world, skin protects us while advertising our health, our identity, and our individuality. This dazzling synthetic overview is a complete guidebook to the pliable covering that makes us who we are. Skin: A Natural History celebrates the evolution of three unique attributes of human skin: its naked sweatiness, its distinctive sepia rainbow of colors, and its remarkable range of decorations. 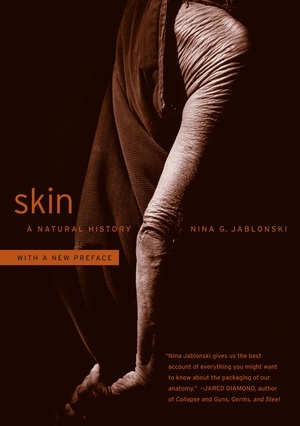 Jablonski places the rich cultural canvas of skin within its broader biological context for the first time, and the result is a tremendously engaging look at us. Nina G. Jablonski is Distinguished Professor of Anthropology at the Pennsylvania State University. She is the author of Living Color: The Biological and Social Meaning of Skin Color (UC Press). Her research on human skin has been featured in National Geographic, Scientific American, and other publications.